A short week this week to ease back into our learning. In maths we will be learning about money, recognising all the different coins and notes we have and counting in pounds and pence. You could help your child by looking at money at home and by counting different amounts. In literacy we will be talking and writing about their favourite part of the Christmas break. In topic we will be talking about our value for this month, honesty, and what this means. Hello and welcome back to term 3. We hope you had a lovely break! In maths we will be learning all about multiplication, division and money. The children will be counting in steps of 2, 3, 5 and 10 before learning how to link this to answering times table questions. The children will also be given the chance to use Times Table Rockstars for the first time. They will be provided with a log in and password so they will able to use this at home. In money we will be learning about the different coins, making different amounts using coins and giving change. This term our science topic will be How humans stay healthy. 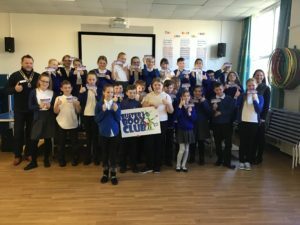 We will learn about the importance of healthy eating, exercise and staying clean. In topic we will learn about the lives of Florence Nightingale and Mary Seacole and how they improved cleanliness in hospitals. P.E. days for both classes is Wednesday so can you please ensure all children have full P.E. kit on this day and any earrings are either removed or taped up. If you have any questions please don’t hesitate to ask us. Christmas is getting closer and closer! This week is our Nativity performances on Tuesday at 9.15 and 2.15. Could you please send in any costumes by Monday as we are having a dress rehearsal to the rest of the school. 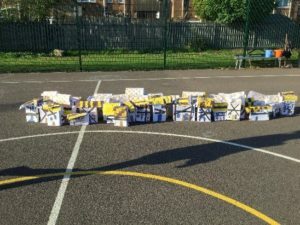 The children have been working very hard and we are sure you will enjoy it. Our class parties are on Friday. As this is also Christmas jumper day there is no need to send in a change of clothes. We are using the money we raised at the Christmas Fair to provide some treats for the children so we are not asking for donations this time. The rest of the week will be taken up with some Christmas craft activities for the children to bring home so don’t forget to check their bags on the last day! Next week we are going to the pantomime on Monday so please don’t forget to send your child in with a packed lunch. School will finish at 2.15 on the Tuesday. We hope you all have a fantastic Christmas holiday and look forward to seeing you back in 2019. Mrs Wouldham and Mrs Guilder. In maths we will learn to subtract 2 digit numbers using jottings and concrete resources. In our topic we will learn about hot and cold climates around the world and where they are in the world. We will be having our final rehearsals for our nativity which we are really excited to show you. Every child should bring home a letter about their costume. If you do not receive this please speak to the class teacher. Please remember that if you want to come and see the nativity then you must return the slip at the bottom of the letter that was sent home. We will be starting this week with a winter art day. We will make tree decorations, which the children will bring home at the end of term, paper plate trees, decorate the cups and saucers we made last week and also make items for the Christmas hoop decorations in the hall. In literacy we will be thinking about winter and what it means to us. The children will then write descriptive winter poems. In maths we will be adding 2 digit numbers using resources and learning how to use jottings to help us solve the calculations. 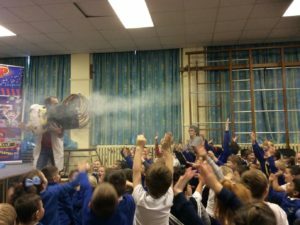 We will be continuing our rehearsals for the Year One and Two nativity, which is starting to come together really well now. This week will be all about the Polar Express. 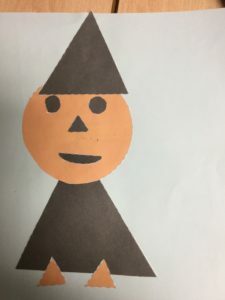 On Tuesday it will be our hook day where we will learn all about the story and carry out lots of lovely art and craft activities based on the story. In the afternoon we will even get to drink some delicious hot chocolate! Following on from that we will be writing letters to father Christmas, telling him all the reasons why we should get the first present at Christmas. In maths we will be adding and subtracting 2 digit numbers and solving problems based on these skills. In science we will be investigating which surface will be best to make a snowmobiles runners from. Don’t forget P.E. is on Wednesday and all earrings should now be removed. Thank you. In literacy this week we will be continuing our work on the book Penguin on Holiday. 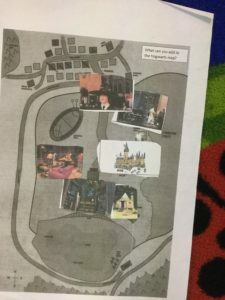 We will be writing our own versions of the story by changing the setting and characters. In maths we will continue our work on addition and subtraction by learning to add and subtract from 2 digit numbers. 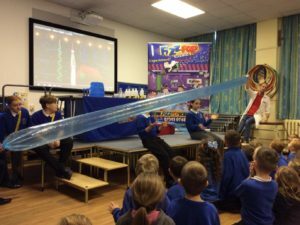 Our science investigations will continue as we try and find out which material will be best to put in Penguin’s goggles while he is skiing! In topic we will complete our Penguin art. We will also start learning our Nativity play scripts and songs. I’m sure the children will look forward to performing this to you near Christmas. 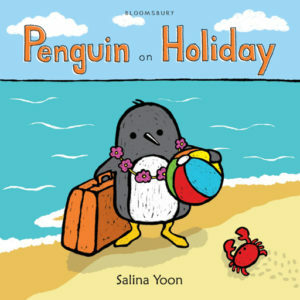 In literacy this week we will be reading Penguin On Holiday by Selina Yoon. We will be learning all about the story and the things Penguin gets up to before writing thank you letters to Crab for a fantastic holiday. In maths we will be adding and subtracting tens to 2 digit numbers, using the resources in class to help us. Our science investigation this week is to see which material is best to help Penguin mend the hole in his bucket! In topic we will create icy backgrounds for our penguin art and also use the laptops to research the continents of the world. 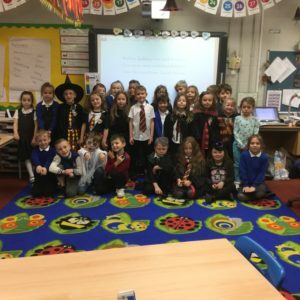 We have had a brilliant week being at Hogwarts. Congratulations to Hufflepuffs who were the house point team winners. Here are a few photos of the week. Welcome to Hogwarts! This week the school is being transformed into Hogwarts from The Harry Potter set of books by JK Rowling. Our work this week will all be based on spookiness! In literacy we will read part of the Witches’ Spell from Macbeth. We will talk about the language used and perform the poem in groups. Then we will describe some spooky ingredients before writing our own spell poems. 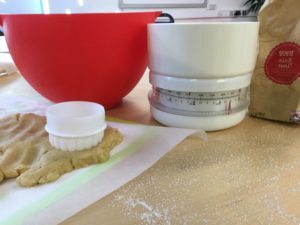 Maths this week will be all about measures. 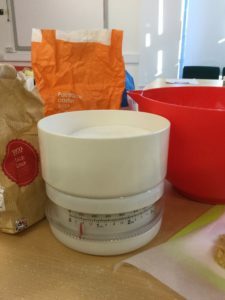 We will measure how long some wands and broomsticks are, Weigh out ingredients to make some spooky biscuits and measure some liquids to make some magical potions. The class will receive a letter form Harry to tell them that Dobby has got into the ingredients cupboard and taken all the labels off the containers. They will need to investigate how all the different powders react with water so they can help sort out the mess! We will also be making magical wands, maps of Hogwarts and using shapes to make pictures of witches. It should be a really fun week. We are really looking forward to it! Don’t forget Friday will be dressing up day as your favourite character. 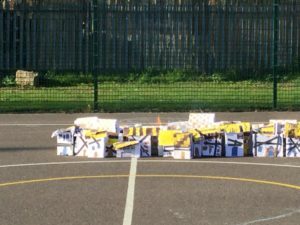 Today we used the Tudor houses we made last week to make a Tudor Street in the time of the Great Fire Of London. 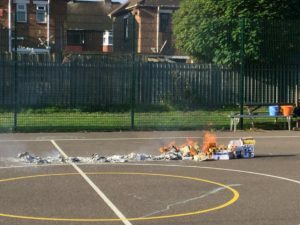 We set fire to one of the houses and watched to see what would happen and learn why the fire spread so quickly. 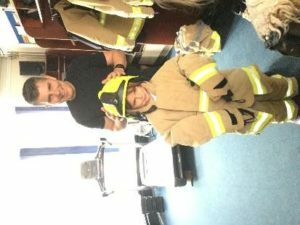 On Thursday 20th September Year 2 visited Sheerness Fire Station. 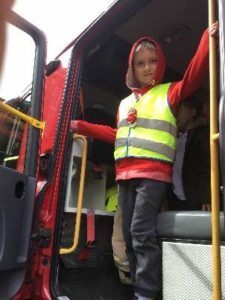 The children learnt all about fire safety and had lots of fun trying on uniforms, sitting in the fire engine and squirting the hose. 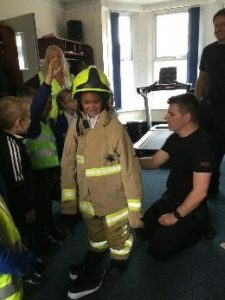 On Thursday we will be visiting the fire station. Peacock class will visit in the morning and Owl Class in the afternoon. Please look at the weather forecast and ensure your child is appropriately dressed for the weather as we will be going even if it rains! 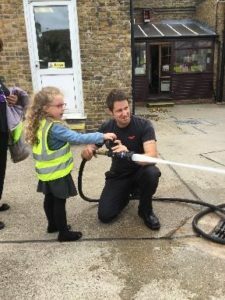 In English we will be completing our reports about the Great Fire Of London, writing questions to ask the firemen and then writing a recount about what we did at the firestation. In maths we will continue our work on place value by learning to compare numbers to 100 using the < = > symbols, and learning to order numbers in different ways. 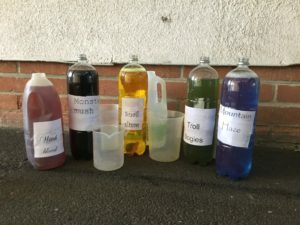 In science we will be walking around the school to identify the different ways materials are used in school. On Thursday this week it is Roald Dahl Day. The children are invited to come dressed as a Roald Dahl character or to wear something yellow. We will be reading the Enormous Crocodile, making wanted posters about the crocodile and completing some fun craft activities. In English we are going to become reporters. We will be asking some questions about the Great Fire; Where and when did it start, How long did it last etc, Then carrying out some research to find out the answers before writing our reports. We will also learn how to change verbs into the past tense. We will continue our work on place value in numbers by learning how to partition numbers in different ways. Topic We will complete our Great Fire Of London pictures by adding the sky line of London to our fiery backgrounds. We hope to complete our accelerated reader star reader quizzes this week. This will enable us to send reading books home at the appropriate level for your child. Look out for a letter explaining the scheme in greater detail. English For our first week back we are looking forward to hearing all the fantastic things the children got up to over the summer holiday. Please could you send in any of the packs we sent home before the holiday to help the children remember. Maths we will be learning how to recognise numbers that are represented in different ways. It would be really beneficial if your child was confident in counting in tens so any practise you could do would be amazing. In topic we will be starting to learn about the Great Fire Of London, We will learn about how London has changed from 1666 to now. 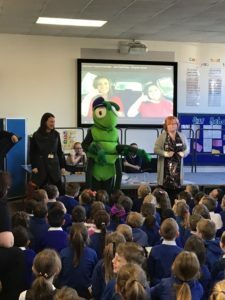 Our value for this month is responsibility and this week the children will think about ways in which they can be responsible. In our art lesson we will be mixing colours to create a colourful, fiery background. On Fridays we will be sending home a spelling sheet with some words for your child to practise. These do not need to be returned as we will not have a weekly spelling test. Instead your child will have opportunities to practise these words in school. At the end of the term we will carry out assessment of the term’s words to check on your child’s progress. PE is on Wednesday, can you please ensure PE kit is in school. Welcome back to school year 2. We hope you had a fantastic summer holiday. We certainly enjoyed ours! Our topic for the first term will be fire! 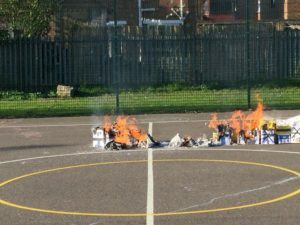 we will be learning all about the Great Fire Of London and Samuel Pepys . We have lots of art activities planned to link with the topic too. 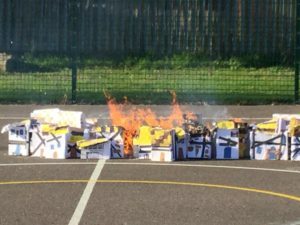 In English we will be doing lots of non fiction writing: reports, recounts, instructions and diary entries, most linked to our fire topic. Maths will be all about place value in numbers to 100. We will learn all about how many tens and ones there are in each number and use this to help us order, compare add and subtract numbers to 100. 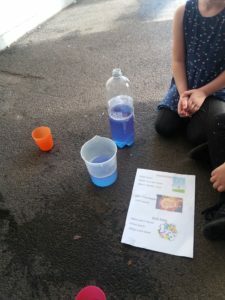 Our science topic is Materials and their uses. we will learn to identify different materials and then think about why they are suitable for different jobs. P.E. for both classes will be on a Wednesday so could you please ensure full kits are in school every week. 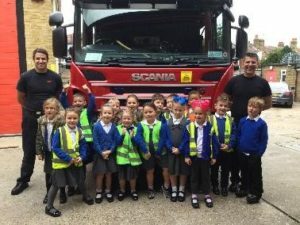 We are really looking forward to working with you this year and seeing how much progress the children make. If you have any questions or concerns please ask us. Mrs Wouldham Owl Class Teacher. Welcome back Year 2 to your final term with us! We hope you have had a lovely and enjoyable break and are ready to come back. 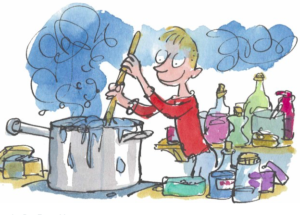 This term our topic will be called ‘Mad Scientists’ and you will be conducting a lot of experiments in Science. You will be investigating different changes, writing predictions and using scientific language to explain what has happened. In Literacy we are going to be doing lots of writing! We will be using a story called Izzy Gizmo by Pip Jones. We will be using this story as a model and you will be changing key parts before you write your own version. 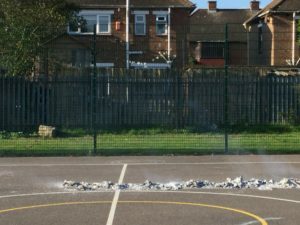 You will be having a go at writing a poem, a recount of sports day and a re-write of a Science experiment. Maths will be a mixture this term of different topics. We will be finishing measurement before we re-cap addition, subtraction, multiplication and division. The children will be re-capping money and answer one or two step word problems. 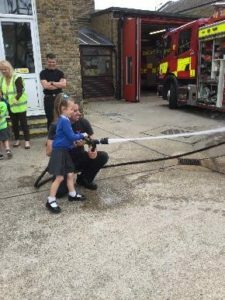 In Topic the children will continue to learn about the Isle of Sheppey. They will be using maps and mapping out a local walk to the beach. This will give the children an opportunity to re-cap compass directions. We look forward to having a fun and enjoyable term with you!